Because as Winter Knight to the Queen of Air and Darkness, Harry never knows what the scheming Mab might want him to do. Usually, it's something awful. Mab has just traded Harry's skills to pay off one of her debts. And now he must help a group of supernatural villains--led by one of Harry's most dreaded and despised enemies, Nicodemus Archleone--to break into the highest-security vault in town, so that they can then access the highest-security vault in the Nevernever. It's a smash and grab job to recover the literal Holy Grail from the vaults of the greatest treasure hoard in the supernatural world--which belongs to the one and only Hades, Lord of the freaking Underworld and generally unpleasant character. Worse, Dresden suspects that there is another game afoot that no one is talking about. And he's dead certain that Nicodemus has no intention of allowing any of his crew to survive the experience. Especially Harry. 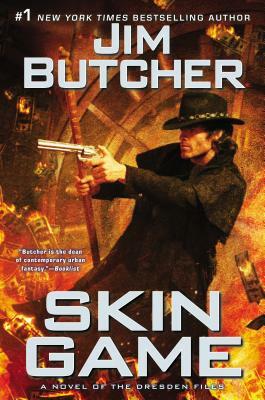 A martial arts enthusiast whose resume includes a long list of skills rendered obsolete at least two hundred years ago, #1 New York Times bestselling author Jim Butcher turned to writing as a career because anything else probably would have driven him insane. He lives mostly inside his own head so that he can write down the conversation of his imaginary friends, but his head can generally be found in Independence, Missouri.